闫慧敏, 张梅, 张笑, 夏云婷, 申涛, 赵振平, 陈志华, 黄正京, 王丽敏. Yan Huimin, Zhang Mei, Zhang Xiao, Xia Yunting, Shen Tao, Zhao Zhenping, Chen Zhihua, Huang Zhengjing, Wang Limin. Yan Huimin, Zhang Mei, Zhang Xiao, Xia Yunting, Shen Tao, Zhao Zhenping, Chen Zhihua, Huang Zhengjing, Wang Limin. Study of epidemiological characteristics of metabolic syndrome and influencing factors in elderly people in China[J]. 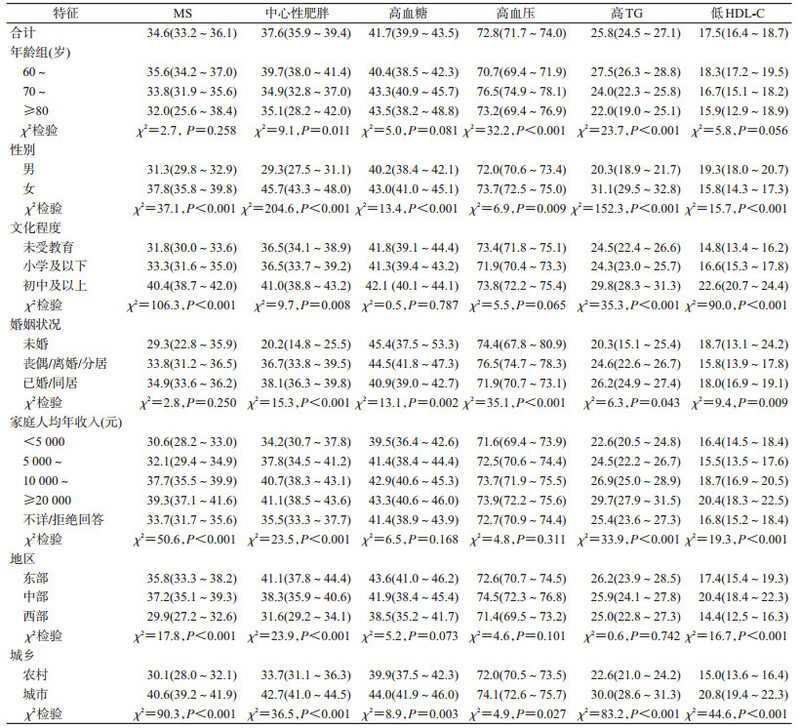 Chinese Journal of Epidemiology, 2019, 40(3): 284-289. Abstract: Objective To estimate the prevalence of MS in elderly people aged ≥ 60 years and its related factors in China and provide scientific evidence for prevention and control of MS in the elderly. Methods Data used in this study were obtained from the 2013 Chinese Chronic Diseases and Risk Factor Surveillance Program. A total of 50 497 people aged ≥ 60 years were selected and interviewed through multistage stratified cluster sampling at 298 surveillance sites in 31 provinces. 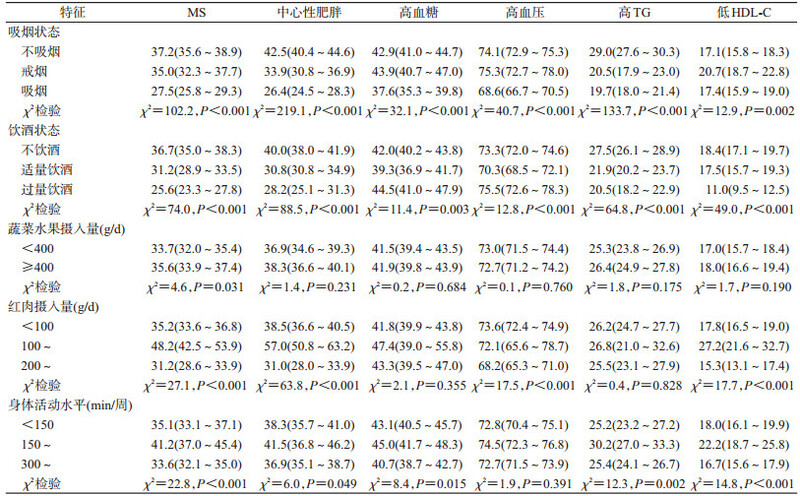 According to the Chinese MS diagnostic criteria proposed by the Chinese Medical Association Diabetes Branch in 2017, the prevalence rates of different MS forms were compared, and the main related factors were analyzed. Results The prevalence rate of MS was 36.9% (95% CI:35.4-38.5). The prevalence rate was higher in urban area than in the rural area, higher in females than in males, higher in eastern area than in western area. The prevalence rate of MS in elderly people aged ≥ 70 years was lower than that in those aged 60-69 years. The rate in the elderly with higher education and income levels was higher than that in the elderly with lower socioeconomic level. The comparison of the prevalence of the five forms of MS in the elderly showed that hypertension had the highest prevalence rate (72.8%), followed by hyperglycemia (41.7%) and central obesity (37.6%). The prevalence rates of hypertriglyceridemia and low HDL-C were 25.8% and 17.5%. The risk for MS in women was 1.20 times higher than that in men. Age, gender, education level, living area and urban or rural residence were the main factors influencing the prevalence of MS. Smoking, drinking and physical activity levels were correlated with MS. Conclusions The risk for MS was higher in women than in men in China's elderly population, and the risk was related to socioeconomic level and life behaviors. It is recommended to carry out lifestyle interventions, such as increasing exercise and having reasonable diet for the elderly patients with MS. Hypertension and diabetes patients also need to be treated with drugs to reduce the risk of cardiovascular disease morbidity and mortality. 中华医学会糖尿病学分会. 中国2型糖尿病防治指南(2017年版)[J]. 中华糖尿病杂志, 2018, 10(1): 4-67. 翟振武, 郑睿臻. 人口老龄化与宏观经济关系的探讨[J]. 人口研究, 2016, 40(2): 75-87. Zhai ZW, Zheng RZ. On the relationship between aging and macroeconomy[J]. Popul Res, 2016, 40(2): 75-87. 王丽敏, 张梅, 李镒冲, 等. 2013年中国慢性病及其危险因素监测总体方案[J]. 中华预防医学杂志, 2018, 52(2): 191-194. 中国疾病预防控制中心. 中国慢性病及其危险因素监测报告2013[M]. 北京: 军事医学科学出版社, 2016. Chinese Center for Disease Control and Prevention. Report on chronic disease risk factor surveillance in China[M]. Beijing: Military Medical Science Press, 2016. 中国营养学会. 中国居民膳食指南[M]. 北京: 人民卫生出版社, 2016. Chinese Nutrition Society. The Chinese dietary guidelines[M]. Beijing: People's Medical Publishing House, 2016.
WHO. Draft action plan for the prevention and control of noncommunicable diseases 2013-2020[R]. Geneva: World Health Organization, 2013. 何宇纳, 赵文华, 白国银, 等. 中国成年人肉类食物摄入与代谢综合征的相关性研究[J]. 中华流行病学杂志, 2018, 39(7): 892-897. 何宇纳, 赵文华, 赵丽云, 等. 中国2010-2012年成年人代谢综合征流行特征[J]. 中华流行病学杂志, 2017, 38(2): 212-215. 中国疾病预防控制中心. 中国慢性病及其危险因素监测2010老年健康专题报告[M]. 北京: 军事医学科学出版社, 2014. Chinese Center for Disease Control and Prevention. 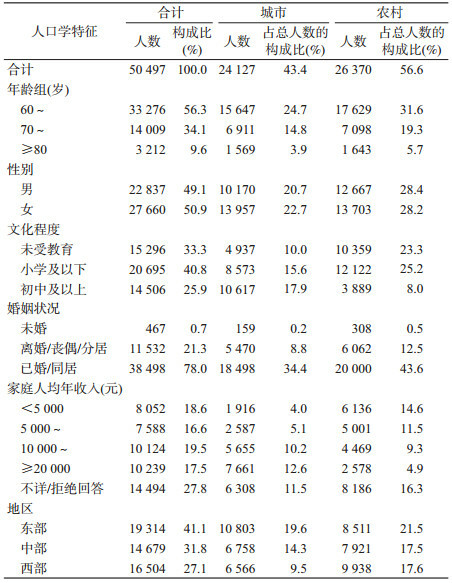 Report on the status of elderly health:chronic disease risk factor surveillance in China 2010[M]. Beijing: Military Medical Science Press, 2014.